This classic Italian-American dish is one of the simplest yet most rewarding in flavor. Thinly sliced chicken breasts are floured and dipped in egg before being sautéed with a lemon-butter and white wine sauce. Chicken Francese is something I grew up eating a lot in New York. It is on every Italian menu across the tri state area. There is a good reason for this. It’s simple. It’s fresh. It’s lemony. And it has a sauce you want to mop up with every single bite. This dish is one of my 30 minute weeknight recipes I have at my fingertips at all times. When it’s just the four of us eating dinner I can keep it super informal and place the skillet right on the table. In case anyone is running late I can also pop it in the oven to keep it warm. But it is also elegant enough to serve on a big white platter garnished with a few lemons to let everyone know there is a delicious lemon flavor about to come their way! It’s hard to know who deserves the credit for this delicious dish – the Italians or the French. When I spoke with an Italian immigrant at my local market the other day, he of course said Italian. But it’s hard to deny the French influence with the butter and wine. 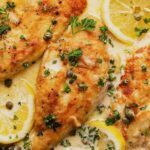 Chicken Francese is usually served alongside some simple pasta and a salad in Italian restaurants so the simplicity and freshness of the francese is enjoyed. 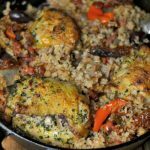 LOOKING FOR MORE EASY WEEKNIGHT CHICKEN DINNERS? It’s Here! 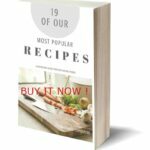 Our 1st Ebook!